← Why should anyone care? So the tipping point was social. That thought — a wrong one I hope — came to mind in the aftermath of a US election that set back prospects for reducing greenhouse gas emissions before major ecosystem or physical tipping points are reached. Such a setback has always seemed possible, but its sudden arrival took me by surprise. Except that in this instance, public opinion has not reversed. Figure 1 combines data from 4 US surveys and 26 quarterly New Hampshire surveys that asked the same climate question from 2010 to August 2016, with highly replicable results. Over this period, the proportion who think that climate change is happening now, caused mainly by human activities, drifted upwards by about 10 points: from the low 50s to well over 60 percent. The pace has been glacial, still this seemed grounds for mild optimism. But how does this upward drift in public acceptance square with the drastic shift to rejection in Washington? The rightmost data point in Figure 1 above is the Polar, Environment, and Science (POLES) survey conducted by the University of New Hampshire Survey Center in August 2016. Conducting telephone interviews during a presidential campaign, our August survey also asked respondents who they would vote for, if the election were held today. Figure 2 breaks down climate-change responses by voter preference. Only 33 percent of the Trump supporters, compared with 61 to 86 percent of other groups including nonvoters, agreed that human activities are changing the climate. The POLES survey had a two-stage design, with its second stage just after the election. Both stages asked mostly the same questions. 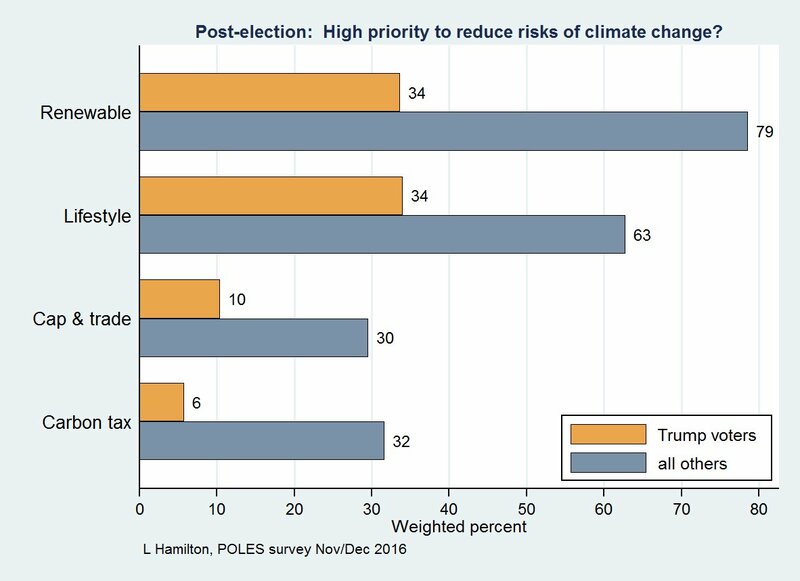 In the pre-election survey 63.4 percent of respondents thought that humans are changing the climate; after the election 64.5 percent thought so, a nonsignificant rise. The post-election survey asked respondents who, if anyone, they voted for. Their choices included a new option for people who said they voted for other offices but not for president. (Survey researchers well know that self-reports of intentions or voting are not the same as actual voting, but they nevertheless provide useful proxies.) Figure 3 shows the climate-change breakdown. Twenty-five percent of self-reported Trump voters, compared with 68 to 99 percent of all other groups, agreed that humans are changing the climate. (The “no president” group is small, so their high percentage should not be over-interpreted.) However, the broad pattern of Figures 2 and 3 appears robust: in their views on climate change, Trump supporters stand far apart not only from Clinton supporters, but also from people who voted for other candidates, left the presidential choice blank, did not vote, or declined to say. Each of these groups differs significantly from Trump supporters, although not necessarily from each other. Roughly similar patterns occurred with other climate-related or science questions on the surveys, including the physical facts of CO2 buildup or Arctic sea ice decline, whether scientists adjust their findings to get the results they want, whether science agencies such as NASA can be trusted for climate information, and whether renewable energy rather than more drilling should be a US priority. Figure 4 contrasts Trump-voter percentages with those for all other voter groups combined (post-election results shown; the pre-election survey found this pattern too). As usual, partisan divisions are widest on climate change. The science and environmental views of Trump and Clinton supporters align roughly with their candidates; that result is not surprising. A less obvious result is that people who did not vote for either Trump or Clinton — because they chose a different candidate or did not vote at all — are generally closer to Clinton than to Trump in their science/environment views. The non-voters tend also to be younger, so consequences from policies associated with these views, such as slowing down or speeding up climate change, could play a larger role in their lives. This entry was posted in Climate change, Politics, Research. Bookmark the permalink. I have not yet managed to convince anyone to take emisisons mitigation seriosuly, mostly they just blame others for their own profligate emissions. I blame anyone emitting more than about 3t of ĈO2e, I’m under that and wonder why others aren’t ? On another note, have a great Christmas ! Yes perhaps should post here what their actual annual emissions are. I am sure that it would be fun knowing other peoples emission levels. The drift up may relate to the innocuous 350 campaign strategy and the President’s disingenuous “do all we can do for climate” game theory efforts that are integral to Wall Street’s Paris Agreement. The gravity of what abrupt climate change constitutes as a threat is absent in the outer space-like thinking that limited liability law enabled markets have imprinted on the human psyche. FWIW, there is no scientifically significant difference between projected Obama-Clinton climate policies and Trump’s. A carbon sucking fairy godmother is integral to the game theory strategies that resulted in Paris. Then for most UK families to operate requires them to own a car, which will typically produce around 5 tonnes CO2 per annum for average annual mileages. [ http://www.carbonindependent.org/sources_car.html ] So you’ve arrived at more than 10 tonnes a year for the average household without even including other items such as food and holidays. Now it’s true that individuals can make a difference. But will the actions of a few concerned people who manage to break away from the norm and behave differently—and perhaps uncompetitively— add up to anything significant, nationally speaking? Absolutely not. For changes to happen, attitudes across our entire society have to alter. Housing stock has to be upgraded to zero, or near zero; carbon and all transport has to be electrified. Most importantly, our power generation has also to become zero carbon. These are systemic changes that only society as a whole can undertake. If you want to make a difference, the best you can do is help create political pressure for change—and by all means demonstrate to your fellow citizens that you care about your own carbon footprint. But please don’t play into the hands of those in denial by helping point the finger at individual emissions which the average person can do very little about. I loathe willy-waving competitions for exactly these reasons. I guess the other problem with focusing on individuals is that we’d probably quite like to maintain our standards of living and – ideally – expand it to others. We’d also quite like to do this without continuing to emit CO2 into the atmosphere. Maybe it’s going to turn out very difficult, but expecting some to simply do less because they’re arguing for emission reductions is unlikely to be an effective way of finding out. What would the “climate debate” look like if there weren’t a focus on individuals? Yabbut, the “only changes at the societal level scale are effective enough” argument suffers from a rather glaring hole as well: It’s not working. Particularly not at the pace required, where, for instance – with all of our gee whiz technology – we have managed to get wind-water-solar-geothermal combined up to a whopping ~ 1.5% of global total primary energy supply, and it is 2016. Pretty much the only way you can make a meaningful** near-term dent in the still over 80% of TPES that is sourced from fossil-fuels* – is to deliberately *use* less near-term (which is the Kevin Anderson argument***). And that is almost entirely about behaviour change – whether personal choice, peer/societal pressure, rationing, etc. Diet changes, Forgoing flying. Taking public transit. Walking. But people really can’t be bothered with this. Literally, they really can’t be bothered. Because by their very choices they are revealing that their priority is maintaining their status quo over those who they actually *know* will be harmed. Yes, of course people *say* that climate change is the greatest threat that humanity has ever faced, and they *say* we must do everything we can now to prevent the worst from occurring, and they *say* that the most important things in their lives are their kids and grandkids and their futures. But they actually don’t behave that way at all. And because of the cognitive dissonance that engenders when they look in the mirror, they need to scan the horizon for a rationalization and there it is: I don’t personally make those changes because too many of my neighbours are free-riding and besides, my behaviour can’t make that much a difference, and besides^2 I *only* emit about 20 tonnes a year personally, so I am not that bad really. This is apparently the hill we are choosing to die on. Because the renewable energy/EV calvary is not up to the task of riding in to rescue us in time. And I am sure that there is lots of psychology research that shows that if you ask people to make a sacrifice, they will tune out/shut down. Maybe that is the case. Because it would go a long way to explaining the cognitive dissonance. Ergo, the hill we appear to be choosing to die on. * By the way, that is just for the energy-related emissions. Let alone the agricultural, deforestation and cement emissions. Which, again, can only get meaningfully addressed near-term by deliberately using less. ** Something that is going to deliver something in the “not dangerous” cumulative emissions range, save some energetically miraculous direct-air-capture & sequestration solution spontaneously arriving like Mighty Mouse to save the day. I think it is clear that the national elections were not about global warming. Maybe most of us here think they should have been, but they were not. This was an outsider election cycle with high levels of dissatisfaction with the status quo and the blue party ran the most insider candidate they could find while the red party ran a very outsider candidate. It’s disastrous and could/should have been avoided and that would have been good for addressing global warming, but as mentioned above, we, the american people, are still concerned about global warming. We are willing to do almost anything to address global warming as long as it does not inconvenience us, cost jobs, or threaten a fragile economic recovery. I don’t want there to be any confusion here. I agree that individuals should make genuine-not-token efforts to use less FF-generated primary energy. I just don’t think they should allow themselves to be goaded into talking about it or contrarians twist everything into another pop at Al Gore or DiCaprio’s carbon footprint. As for influencing the bigger picture, it would be nice if more people decided not to vote for climate change deniers and by extension, inaction. Competitive hairshirting is unlikely to do much good against right-wing populism. We are veering away from the topic of the interesting data Prof. Hamilton shared with us in the main post. A lot more realistic, but politically unacceptable in many societies. The extraction, transport and distribution of fossil fuels are all carried out by systems much larger and more powerful than any individual. It is possible for an individual by judicious choice to minimise their consumption of FFs, but such exercises are largely totemic. A method of feeling far more morally righteous than is justified by the insignificant difference it makes to actual emissions. It is odd that the US legal system has recognised that a business is an intentional agent – like a person, yet it is a society that seems most resistant to the idea that governments and private business can be an active entity with far more influence than any individual. Perhaps it is the concept of American exceptionalism that creates a myopia about the inevitable limitations on personal autonomy that civilisation entails. So which tipping point? The change is time is small. Maybe even smaller than expected given that conservatives like to adopt the opinions of their leaders. I have seen several reports of environmental and human rights organization seeing an influx of people. Many more than normal people on Reddit asked for information on climate chance and what they could do. That sounds more like a social tipping point to me. Is the contrast Trump vs Non-Trump larger than the contrast Republican vs Democrats? The good numbers for people who did not support Trump suggest that most people that can be reached by arguments have been reached with the information. These people are a clear majority. If they fight for their convictions that would make a real change. That would be the group I would focus on for scientific information. The sad numbers for Trump supporters suggest that we should have a look how many in the mitigation sceptical movement are motivated by racist tendencies. People don’t feel the risk in their every day lives, nor do they see the harm being caused to others in a clear and concrete manner. That is why I think that looking at this as a problem of individual behavior, or even behavior among a collection of individuals, misses something about the “wicked’ nature of the problem. I would take it a step further. Consider this Elizabeth Colbert quote: “It may seem impossible to imagine that a technologically advanced society could choose, in essence, to destroy itself, but that is what we are now in the process of doing.”. The problem with this formulation is that it assumes that civilizations are capable of making such choices. Whether or not this is in fact true is debatable. It may be just as likely that choices at the civilization level are even more constrained than those at the individual level albeit for different reasons. That IMO is why climate change is such a wicked problem. What would the climate debate look like if the pause that never happened had lasted 20 years instead of 15? Anyway, I try to walk to do shopping, eating out, etc. Have cut the annual mileage on my car in half, and I’m down from 220 lbs to 157… basically high school weight. I could live without AC in Texas, but my wife thinks she would die. Google Pew, Gallup and YouGov for polls of where concern about dealing with climate change ranks. It ranks dead last compared to other items of concern. The YouGov data is from global polling. I did polling for several years. If you ask, in isolation, a question like the above whether climate change is happening and is caused by humans, of course you will get majority yes answers. Given the reams of newsprint and hours of broadcast airtime that have flogged these points relentlessly, of course lost of people will say they believe this. But what is also true is that flogging this meme hasn’t convinced people that dealing with it is more important than almost any other major problem. People just haven’t been convinced. Yes. How does a society make a choice/decision, exactly? The 10% burning 50% of the fossil Carbon is not the result of individual choice for the 10% who benefit from that setup. Unless you are an economic migrant. Neither are individuals directly responsible for such an unequal distribution. It seems to be historically contingent rather than a matter of choice. Imperial ambitions and technological advances got us into this mess around 100 years ago. At least that shows that civilisation can change that fast within a century. Through the ballot box. Works great with a well-informed electorate. Counter examples, (Brexit, Trump?) seem to predominate. Should be more discussion on personal CO2 emission levels, the level people think we are at and where we should be. Have just flown across Australia for Xmas with family members I would not otherwise see. Hate to think of the cost in CO2 but absolutely enjoyed the privelige to be able to do so. What sort of a world are we proposing. No trips for those able to afford it? No car to run around in? Or get to work. No carbon use at all, see above. Anyone rich enough to own a hundred acres of growing trees and then claim that this accident somehow reduces his personal carbon footprint is missing the argument I feel. I might well be wrong but it is the amount of CO2 one emits through ones choice of lifestyle that is the issue here. Not some forest ,electric car or toaster that you can write your sins off with. The cognitive dissonance as RNS said. The solution long term will be a smaller population of humans with higher standards of living and reduced fossil fuel use. Good luck getting that voted on by anyone. I don’t see this as definitively true. If it is, then we would only be able to sustain/expand current standards for a finite time even if climate change was not an issue. Are you suggesting that it isn’t really possible to have a technologically advanced civilisation unless we burn fossil fuels and emit their CO2 into the atmosphere? There are many aspects that make up our standard of living in the rich west that are dependent on FF use, but many that are not. Energy generation is locked into FF for historical and economic reasons, but examples of advanced western standards of living are possible without much FF use. The problem is that as a dominant part of the global economy there are massive inertial forces, many invisible hands, opposing any diminution of FF use. The only part of that which is necessarily true is the reduced FF use, because it is a finite resource. The maximum carrying capacity of the Earth is limited by technology, but even with present day means and minimal FF use 20billion does not seem impossible. Advances in energy storage and nuclear generation could probably double that. Isn’t it interesting how the anti-greens are the biggest believers in Maltus and the Club of Rome? ATTP I hope, along with everyone else that cheap reliable non fossil fuel alternatives take over. Plus a good standard of living. We need less people and I am not a volunteer. A tipping point will be overpopulation. Yes a high tech society will exist without fossil fuels. angtech If you’re interested I’m starting a kickstarter campaign for my ‘baby boomer to biochar’ project. The Boomers had a good run. new schools, hospitals, low tuition, low taxes, economic booms. Time for them to step up and do their part. Just don’t mention soylent green. It tends to tip them off. I find a couple of comments above a bit inconsiderate of the social cost of being carbon sensitive..
You didn’t understand what I wrote and your ‘criticsim’ is the usual wrong-headed nonsense as a result. Please read again, slowly and in context. Thx. Sadly, several of the “seven deadlies” are in play here: pride and envy in particular. Sadly, getting a life offscreen is not posed as a positive but a negative by many people, “doing without”. I think we could all “do with” getting out more, inventing our own games, not needing giant houses to feel fulfilled, common property as community assets, and I’m getting carried away and need to shut up. Still, the positives of living a constrained ethical life within the bounds of improved humanity seems a goal much to be desired. for question wording. Below, the percentage of “high priority” responses to each question, from our post-election survey. BBD, sorry to upset you, I was not commentating on your views but the two other people’s statements. I agreed with your comment and thought it applied to their comments in a sense. My statement was not intended to refer to yours in any way whatsoever. Unfortunate juxtaposition.